A couple weeks ago I spent six days on Spednick Lake and the St. Croix River, which run betweeen Maine's eastern border and New Brunswick. It was a wonderful trip, the third year in a row that I've done a multi-day trip with kids and another adult, Tim Woodworth. My son, Max, and his friend Paul (Tim's son) were 11 years old this year, so they began at age 9. This year we brought along Paul's sister Fran, age 8, for the first time. It is an absolute joy watching these kids gain paddling skills and the sense of accomplishment that comes with them. The boys have become quite competent paddlers -- far better than most adults I see on the water -- and Max and I make a good team. Maneuvering in Class II, we're in good sync (generally), and there are few criticisms or recriminations when mistakes occur. It is a time for us to play together, to talk about anything with no interruptions other than the occasional stretch of whitewater that requires our attention, or to remain silent and simply enjoy the notion that we are working together, doing something that we both love. When we camp, the kids set up their own tent and keep themselves fully occupied with what they find at hand -- skipping stones, making up games -- they seem to miss their Nintendos not at all. Sleeping in tents is becoming natural to them, and they're getting into a good habit of making and breaking camp without too much prodding (some exceptions apply). More competence, more self-reliance. Tim and I do essentially all the cooking still, but the kids do most of the meal cleanup, again with less prodding as time goes by. By the way, Max took his first canoe trip at the age of three weeks. His Mom wasn't too pleased, but I thought it would be good to start him early. Looks like I got it right for a change! Two years ago, toward the end of the first year's trip, also on the St. Croix (year two was on the Allagash), Max asked me if we could do it again every year. What a thing to fill a father's heart! The photo at the top of the post was taken by a woman whose name I don't know. She kindly offered to shoot us going down Little Falls on our official trip camera. I had the good fortune to paddle a birchbark canoe a few weeks ago at a rather odd event called the Spring Running in Augusta, Maine. The event,which celebrates the annual return of herring to the Kennebec River (i.e., they "run" up river), is a rather sorry affair overall - uninteresting displays and events, dusty and inconvenient layout - but it did have one nice feature this year. In the small waterfront park just below Old Fort Western, the Maine chapter of the Wooden Canoe Heritage Association had a display with many beautiful boats, mostly canvas-on-cedar. Burt Libby, of Burt's Canoes in Litchfield, Maine, had a lovely display of large-scale canoe models (3-4 feet long? 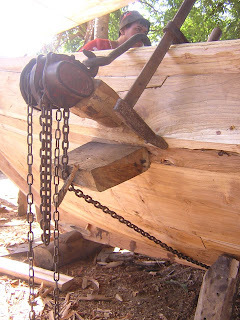 ), showing the stages of the construction of a cedar/canvas canoe. 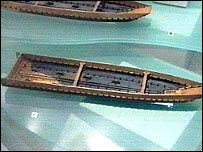 The association had also borrowed a bark canoe belonging to the Penobscot Marine Museum, and allowed people to paddle it. The Penobscot Marine Museum had the canoe built for it within the past few years as part of a demonstration that occurred on its grounds in Searsport, Maine. I'm sorry that I don't know the builder's name, or have any info. on its "type" -- i.e., the cultural/historical style upon which it's based. It looked to be very nicely built and it was in apparently fine shape. The sheathing appeared to be very regular beneath the frames, which had surprisingly high cross-sections, which I imagine would have been rather difficult to bend. 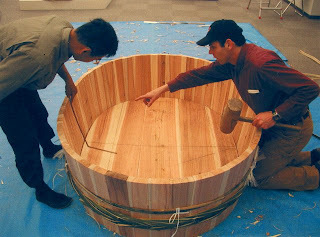 The seams between bark sections were very neatly done; I believe they were sealed with some kind of plastic sealant rather than a more traditional material like pine rosin. I paddled the boat for only a few minutes, kneeling in the stern, with another paddler in the bow. 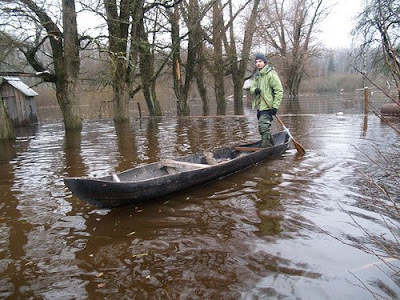 The river at that point is flatwater, with a bit of current; I had very little opportunity to get a feel for the boat's performance or capabilities, but the impression I got was that it felt and behaved very much like any other wooden canoe of its size and design. It felt quite stiff in a structural (as opposed to a hydrostatic) sense. The high profiles of the frames made them rather painful to kneel on, but that's certainly no fault of design or construction -- it's indicative of the paddler not having a proper pad. Having been in storage for a couple years, the canoe leaked a bit, but not excessively, and I expect that the leak would swell itself shut with more frequent use. If not, then it's no great matter to seal it. Lifting it from the water onto the floating dock, it felt not particularly light -- comparable to what a heavily-built fiberglass boat of the same size would weigh. Although the opportunity was very limited, it was still a thrill to paddle a fairly authentic bark canoe. Thanks to the Penobscot Marine Museum and the Wooden Canoe Heritage Association for making it possible. 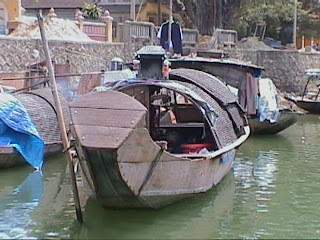 I came across a nice new boating blog that often addresses primitive boats of both western and nonwestern traditions. It's called "70.8%," which, says the blogger Thomas Armstrong, is the percentage of the earth covered by water. Take a look. 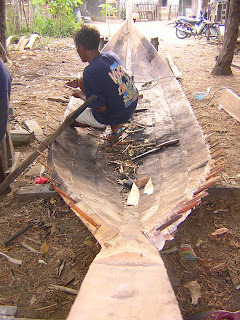 I've been compiling a list of people and organizations who either build bark canoes for sale, teach bark canoe building, or sell supplies for same. The list comes from various sources and I can't vouch for the accuracy or currency of the listings. I hope someone finds it useful. Please get in touch if you know of any other sources to add to the list or have any changes. Thanks. We build custom reproductions of native watercraft for museums and interpretive facilities as well as building canoes as educational demonstrations and as part of artist-in-residencies. We also have multiple canoes available for use in programming and for lease as props for the film and television production industry. 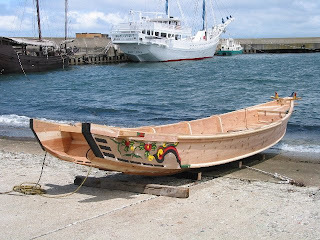 We have build both bark canoes (elm- Southern Great Lakes and birch- Northern Great Lakes) in addition to historic and prehistoric copies of original dugout canoes. 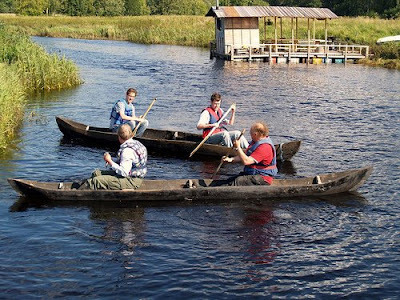 We feature handmade birchbark canoes, fiberglass birch bark replica canoes and museum quality miniature birch bark canoes. We also offer instruction in birchbark canoe construction; sell birch bark for canoes and for rustic furnishings; sell spruce root, crooked knives, paddles, rustic furniture and much more. Birch bark canoes made to order in Algonquin, tete deboulr, long nose Ojibway and fur trade styles. 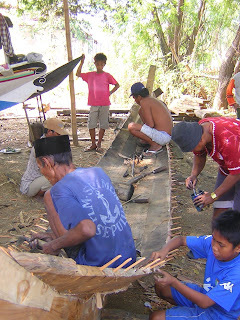 For more information Check Wooden Canoe issues 75, 87, 90, 92, 98 and the 1999 Canoe Journal. Teaches birchbark canoe building courses + 2 day carving horse and paddle making courses near Manitoulin Island. Camp sites included. Brochure available. 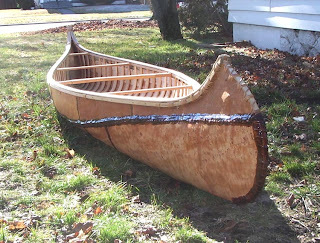 Eric Mase moved to the canoe capitol of the world, Ely , Minnesota in 1996, to build birch bark canoes. Over sixty canoes and 12 years later, he has fine tuned his building techniques and is now considered as one of the finest birch bark builders in the country. Each of his canoes are built using traditional tools and building methods of the Voyageurs and Native Americans, and are not only museum quality but also collector's pieces. Builds 3-4 birchbark canoes per season using traditional tools, materials and techniques. Canoes range in length from 4' model canoes up to 20' long. Also restore and repair birchbark canoes. 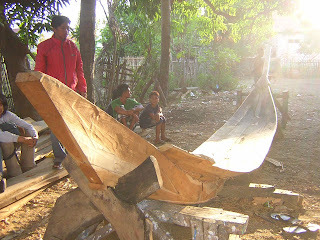 Have been building canoes since 1979. Offers programs, lectures, and workshops in a variety of Wabanaki arts/crafts and other aspects of the culture, including bark canoes. 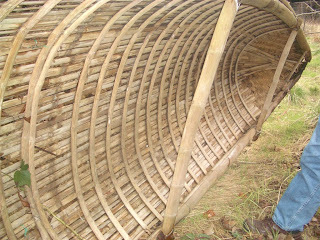 The photo at the top of the page is from the website www.barkcanoe.com. Alan Villiers is well known to readers of tales of the sea. 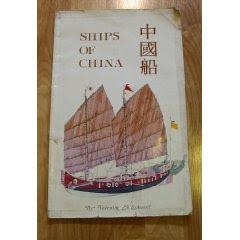 The author of several books, he was an accomplished and wide-ranging sailing ship captain who spent much of his earlier life on sailing ships during their last years of commercial viability, and much of the later portion on sailing ships of various noncommercial colors, including school ships, ships used in making sea movies, historical replica ships, and the like. Seems he had a serious sailing ship jones and would do just about anything he could to continue sailing them. 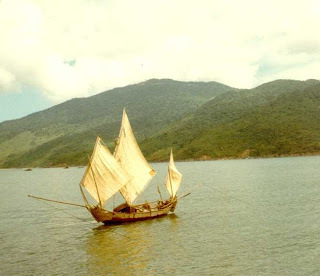 In Give Me a Ship to Sail, he describes many of these adventures, most of which are concerned with more or less traditional "western"-type ships. 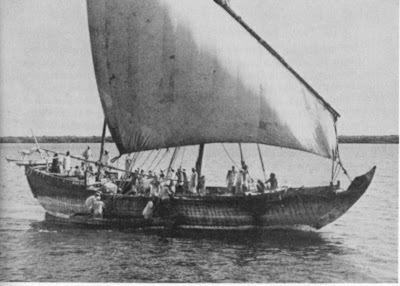 But in one chapter, he describes an Indian Ocean vessel called a buggalow, on which he took passage from Colombo, Sri Lanka (Ceylon, then), to Male, in the Maldive Islands. The buggalow was one of several owned by the Maldives government that served as a combined cargo and ferry service between Ceylon and the one-mile-by-half-a-mile island-city of Male, then a town of some 8,000 people and capital of the Maldives – a group of some 12,000 islands, islets and atolls (of which, only some 215 were inhabited in the mid-1950s). 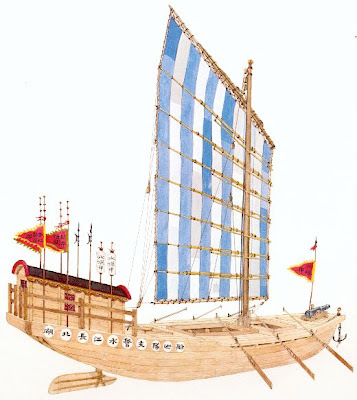 The buggalow was a well-built vessel, built – the master told me – somewhere near Calicut about eleven years previously, at a cost of 90,000 rupees. 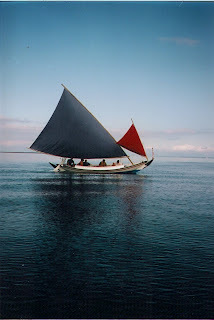 She was a very much stronger, better-built, and better-rigged vessel than any dhow I had previously seen. She had properly caulked teak decks, real hatches and proper waterways, an efficient ship's pump (used very little: she was tight), a good compass binnacle, an efficient capstan of wood and brass, and her fresh water was carried in good steel tanks, on deck. Her "galley" was an adequate firebox with an open hearth, on the foredeck, and her cooks were industrious, well equipped, and competent. Her mainmast was either stepped in, or at any rate well supported by, a strong steel sleeve which extended about four feet above the main deck, and her rigging was exceptionally good and well cared for. Her large assortment of equipment included an old speaking trumpet, a full set of new International Code flags (and the books), a telescope, binoculars, a roll of well-kept and corrected charts kept in an ancient copper cylinder attached to the deckhead in the great cabin, and a number of umbrellas used, I suppose for going ashore in the S.W. monsoon. All of these umbrellas were decorated with little photographs of the Queen and the Duke of Edinburgh, set in silver on the handles. The master had a sextant, deck watch, and the necessary nautical tables, almanac, etc. He had an advanced textbook on arithmetic (in English) and two different Oxford dictionaries. He spoke English well. He was a very quiet little man and I did not discover that he could speak English at all until we sailed, though I had known him in the agent's office ashore for some weeks. He also spoke Hindustani, Arabic, his own Maldivian, and some Singhalese. His ambition was to see his native islands acquire a motor ship and to serve aboard her some day as master. He as a good navigator, working up star sights night and morning and noon sights, position lines by Marq St. Hilaire from the sun, ex-meridians, and anything else he considered necessary. He has to be a good navigator as the passage was of some 415 miles across open sea, with a difficult landfall at the end which had, if necessary, to be made by night. He did not seem to bother much about the International Rule of the Road, nor did the ship show colored side lights, though these were aboard and kept ready trimmed at night. He said it was the custom to show these only when sailing into Colombo. He always had too good hurricane lamps lit and ready for use, and he had a large torch [i.e., flashlight, edtr.] which, he said, he flashed on the sails if he saw a steamer approaching too close. He said that if steamers can close, it made no difference whether he burned side lights, for he was sure that no watchkeeping officers kept any lookout for such antiquated sea lights as the red and green lamps of a sailing vessel. The torch was much better. They sheered off when they saw the sails. As for possible risk of collision with other such vessels as his own, he knew where they all were, and he had confidence in their masters…. On the passage, she [the ship] rolled a lot, running deep-laden before the wind, She set a lateen topsail on the main, which was a sail I had not been with before. She had a main topmast not much stouter than a flagstaff, and the tops'l yard was hoisted on this. It was very light. So was the sail. I slept in the open in preference to the great cabin, which was hot. She steered like a witch and ran like a clipper, and very little rudder movement was necessary to give her a good course. 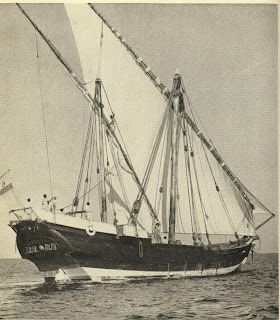 The photo of the buggalow is from the book Give Me a Ship to Sail, which is a darn good read. Sorry for the long black-out. I was locked out of Blogger, for administrative reasons that only Google could explain. I got back in through a purely fortuitous event: a reader posted a comment on an earlier post about Hawaiian canoe ladders; Blogger sent me an email alerting me to the post and giving me the opportunity to approve, deny, or moderate it through a link to the admin part of my blog. I clicked the link and, lo! I was finally back in, and able to reset my password. 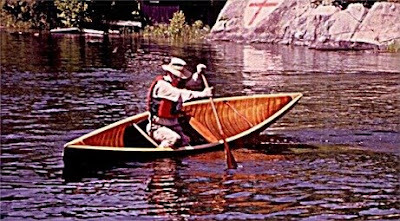 Thanks to A. Orr of Hawaii for the interesting comment on canoe ladders, and for inadvertently creating the way back in to the blog. Here's the original post with the comment. It's good to be back. I'll have some more substantive posts soon. An article in Science Daily a couple months back reported on the results of a fascinating study conducted at MIT's Department of Materials Science and Engineering into the feasibility of coastwise navigation between the two great civilizations of the precolumbian Americas. Archaeologists have theorized about trade between societies in mesoamerica and the Andes based on similarities of metalworking technology between the two regions, as well as the presence of beads made from shells indigenous to only one of the areas that showed up in the other. 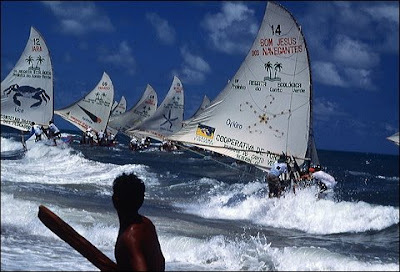 Furthermore, they had descriptions and illustrations by early Spanish, Portuguese and Dutch travelers to the area describing oceangoing sailing rafts. But those two items are a long way from establishing that these rafts were capable of making the multi-thousand mile voyages that would have made such trade possible by means other than overland. Researchers built a small-scale raft approximating what is known of the local technology and tested it successfully on the Charles River, then used performance data from that test and plugged it into engineering analysis (aero- and hydrodynamics, etc.) 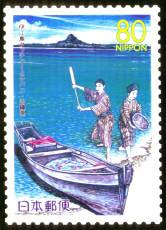 to establish whether full-size rafts were capable of making the trip. The study showed that they could. 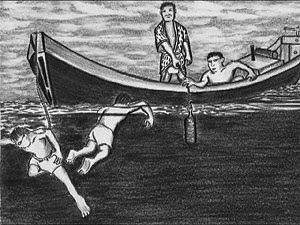 The rafts were steered with two rows of daggerboards, selectively deployed and retracted to alter the rafts' center of lateral resistance fore or aft. (The SD article calls them centerboards, but I think that must be wrong, due probably to the reporter's unfamiliarity with the terminology. Daggerboards, of course, are deployed and retracted vertically; centerboards are hinged at the top.) 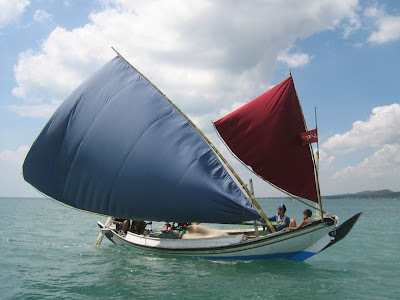 Unfortunately, the article doesn't describe the sailing rig, but does state that it used a flexible mast to alter the shape of the sail and, presumably, the fore-and-aft position of the center of effort. The research also looked into the longevity of the Ecuadoran balsa logs. 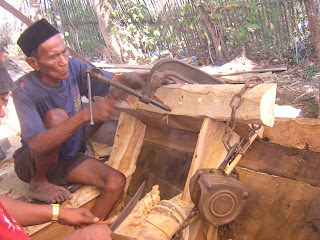 Teredos (shipworms) eat balsa far faster than they eat most other shipbuilding woods, but it was found that, by traveling in the ocean proper and keeping the raft out of shallow water where the worms are most active, rafts could have survived two round trips of six to eight weeks each. Because they relied on seasonal weather patterns (presumably sailing only downwind on seasonal trade winds), only one or two voyages could be made per year by a single raft and its crew. It's not explained how the rafts were kept safe from teredos during the time between voyages. 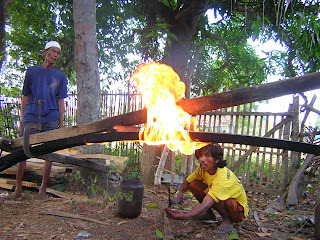 The paper was published in the Spring 2008 issue of the Journal of Anthropological Research. 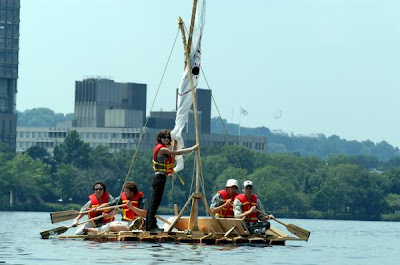 The photo shows the MIT test raft. Photo Credit: Donna Coveney/MIT. I took a canoe day trip last spring that ended in a swim -- not an epic one, but the biggest that I've experienced, and the first for my son. I manned the stern of my Adirondack St. Regis, a 17-foot Kevlar cruiser; my son Max, then 10, manned the bow. 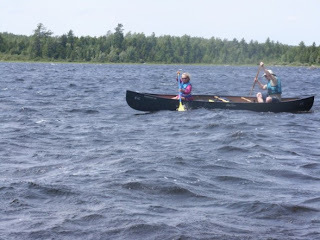 Friend Tim was in the stern of his canoe, an Old Town Penobscot 16, with his son, Paul, also 10, in bow. The previous year, this same team had done a 6-day trip on the St. Croix River, between Maine and New Brunswick. This time, we were on the St. George River in midcoast Maine. It was our first trip of the year -- kind of a warmup for a weeklong trip on the Allagash planned for later in the year. We put in at Seventrees Pond in Union, and the first nine tenths of the trip was flatwater: first the pond, then the river. Several hundred yards above the planned takeout at Payson Park in Warren, the river goes over a steep shelf, which we portaged. Thereafter, it was a very bony Class II. Lots of pushing against the bottom, half getting out of the boat and scooting along with one leg still in the boat, banging rocks. Although my St. Regis is a nice Kevlar boat, it isn't really made for this kind of work, but I long ago got over the pain of scratches and dings. At a point where there was more than enough water to float the boat and plenty of current, we got sideways to a rock and in an instant we capsized upstream. I think I could blame Max for leaning the wrong way, but in fact it happened too quickly for me to really know. The boat then swung with the current and freed itself from the rock. Max was gasping and upset; somehow he was downstream of the boat, and I told him to get upstream of it, then reminded him of the "noses and toes" approach to swimming in current (keep the nose and the toes facing up, with feet pointing downstream) and he took the position. 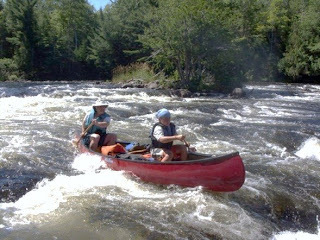 (Max and Paul had practiced this on the St. Croix and had much fun doing it.) I grabbed the boat and tried to maneuver it, but soon the current became too strong, too fast, and I had to let go of it and my paddle and just watch out for myself. This was Max's first capsize; he was scared and shouting frequently but following the drill. Somehow, he quickly ended up on the opposite side of the river and there was no way that I could assist him in any way -- the strong current was dragging me, too, over shallow rocks and through holes down my side of the river. I was terribly scared for Max, but all I could do was keep my eye on him and confirm that he continued to head downriver with the current, apparently OK. If he had somehow gotten into real trouble, I could have done nothing. I did look back and note that Tim and Paul continued to follow us in their boat, which was some comfort. There were a few painful bumps on the tailbone and several dunkings, but the noses-and-toes approach worked as advertised, and I used my feet to fend myself off the worst of the rocks. Even attempting to move to the bank was out of the question -- the current was just too strong to do anything but flow with it. Eventually the current slackened, just in front of the planned takeout at Payson Park. Max came to rest on a little sandy island, and TIm and Paul quickly picked him up and deposited him on the bank. I found my footing and managed to walk to the bank. A woman who was with her children at the park took Max in hand, put him in her van and cranked up the heat and got him into dry clothing. Tim and I grabbed my boat and carried it up the bank -- it was terribly bashed up; gunwales separated from the hull, dents, cracks all the way through the layup, one flotation chamber partially torn out. We found two of the three paddles -- the missing one was a lovely Shaw & Tenney model that I'd used only a couple times. I was somewhat shaken up, and Max more than somewhat -- not enough, I'm glad to report, to interfere with the Allagash trip later that year. We were both wearing good PFDs (of course), and it's hard to imagine the stupidity of anyone who would put himself into that kind of situation without them -- it would have been immensely more difficult and scarier without flotation. It had been a drizzly day, so we were wearing raingear, which might have provided just a hint of thermal protection -- certainly not much. The water was a bit chilly, and we felt it, but wetsuits probably would have been overkill. Maybe I'm kidding himself here. Had this swim occurred away from civilization and been just a few hundred yards longer, hypothermia might have been a possibility. It was a revelation how much damage a few hundred yards of shallow Class II could do to a Kevlar boat. I took it to a fiberglass pro whose repair estimate was about the same as the cost of a new boat. I kept looking, however, and found a fiberglass worker who does some work on the side. He did a nice job on the structural matters and added a minimum of additional weight -- I haven't weighed it, but my guess is less than 5 pounds. The gelcoat is another story. Normally, gelcoat is sprayed into a polished female mold before the layup begins on the inside of the gelcoat, so a nice smooth surface results. In this case, the gelcoat was sprayed with a gun onto the boat's exterior laminate surface, leaving a very slightly pebbled finish. A racer couldn't tolerate it this surface texture, but it's fairly fine-grained and I doubt it will seriously affect the boat's efficiency. 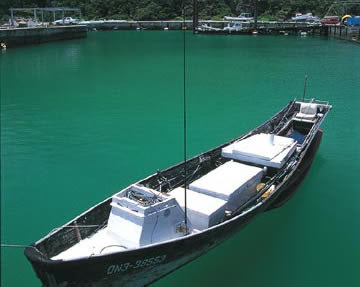 I did take the opportunity to change the boat's color, from green to white and it looks very nice if you don't get too close and notice the pebbles. For a total bill of $500, it was a reasonable way to rescue a pretty nice boat. I now realize it's not at all suited to whitewater, however, so I've got my eyes open for a plastic tub.